While studying the lives of the mystics of the Church for this website, I began to notice an extraordinary supernatural grace in which I think one can readily see the hand of God. For centuries it has been a common traditional belief in the church that Jesus died at the age of 33. The number three, of course, referrers to the Holy Trinity; the Father; the Son and the Holy Spirit. And so two number threes together(33) would refer to the second person of the holy Trinity, which is of course the Son- Jesus. Such facts add a deeper understanding and meaning to the longstanding tradition of the crucifixion, death and resurrection of Jesus at the age of 33. But what caught my attention is that I repeatedly kept coming across mystics in whom, like Jesus, died at age 33. Now, mystics are already a relatively small group in the church, for very few Saints, Blesseds etc. are mystics. And then, to narrow it even further, all 9 of the mystics that died at age 33 were also victim souls, that is, souls who are especially called by God to suffer in union with Jesus for the conversion and redemption of souls. And additionally, 6 of the 9 are also Stigmatics. But, it is precisely that almost all of them are victim souls that makes it so interesting, for the victim souls do not offer or suffer alone---they are mystically bound and united with Jesus, and suffer and sacrifice in union with Jesus for the conversion of souls. But, is it really surprising that these mystics-victim souls died precisely at the age of 33, just like their Jesus in whom they suffered in union with? After all, are they not living images of Jesus' life of sacrifice, and especially His passion? As one after another I repeatedly kept coming across these mystics, all of whom died at age thirty-three, the revelation of it eventually sunk in. So one day I pointed it out to my wife who nonchalantly replied- “Well, it only makes sense don't you think? These persons mystically suffered in union with Jesus for the conversion of sinners. And so, should not many of them then die with Jesus at age 33?’. ‘Well…..sure!’ I replied, as it really did make sense when looked at from that perspective..
And so it seems that for some mystic-victim souls, their suffering in union with Jesus is brought to a consummation by dying like Him at age 33. Such a fact must then be meant to be a sign of the authenticity of their calling and mission, and a heavenly confirmation of their lives of heroic sacrifice and suffering in union with Jesus for the conversion of souls. 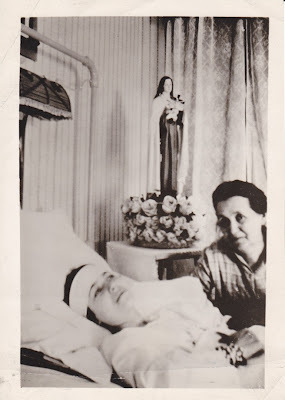 Sr. Josefa Menendez 1890-1923 -mystic, victim soul, bore crown of thorns. I am certain that there are others, especially in earlier centuries, but such are the one's that I have found so far. Of course, I would appreciate suggestions for additions to this list. Finally, I would like to add that another mystic and victim soul, Maria von Mörl (1812-1868) was given the grace of the Stigmata for exactly 33 years. And, as an interesting side note concerning this mystic, she was a contemporary of the Servant of God, Domenica Lazzeri (one of the mystics listed above). One day Domenica, who was completely bedridden, was found missing from her bed. After an extensive search, she was unable to be found. To the surprise of everyone, she was found once again in her bed a few hours later. She was immediately asked where (and how!) she had gone. She replied: "I was taken to my suffering sister, Maria von Mörl, and we prayed to Jesus together." I know Blessed Anna-Maria Taigi didn't die at 33 but do you include her in you list of mystics? You are correct. Blessed Anna Maria Taigi died much after age 33--she was 68 years old when she died. So, she is not included in the eight listed above. Actually, all the individuals you listed were indeed Stigmatics. 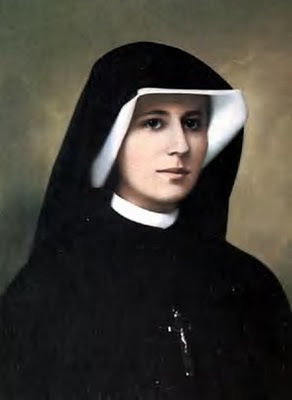 Both St. Faustina and Sr. Josefa Menendez bore the Stigmata in an invisible manner, but felt the pain of the wounds (including the crown of thorns) on several occasions, especially when the Lord requested reparation for a particular purpose or sinner. I'm not certain if St. Michael of the Saints bore the visible wounds, or suffered them in a hidden manner, but he is often listed in books related to Stigmata. And let's not forget St. Therese, who died at the ripe old age of 23! The ancient Greeks had a saying: "Those whom the gods love, die young." Ah, the heart and soul of a woman given to Our Lord completely is a breathtaking, mystical grace. The women far outway the men in both bearing the stigmata and dying at the age of 33. I didn't realize that before. He calls we women to a great grace. We need to be reminded of that which He bestows on those He chooses. When I began studying the lives of the mystics about 14 years ago I too quickly discovered that women mystics have far exceeded the men in number. In fact, in the history of the Church there are almost 3 times as many women mystics as than there are men. And, I would add that the percentage of women vs. men is even greater in the mystics who are victim souls. Almost all the victim souls in the history of the Catholic church have been women. --Although I will say this: Perhaps the GREATEST mystic and victim soul ever was St (Padre) Pio, a Priest who has the stigmata for over 50 years. St Padre Pio is the only *accepted* priest in the history of the Church to bear the stigmata. St Francis of Assisi was another extraordinary mystic and stigmatic, but he remained a religious brother. Thanks for mentioning the beloved St Therese of Lisieux! During my studies of the Mystics of the Church I discovered something very special about her also---since her holy death, St Therese of Lisieux has mystically appeared and miraculously interceeded in the lives of SEVERAL mystics. For example, St Therese miraculously appeared on numerous occasions to the mystics Therese Neumann, Rhoda Wise, and Marthe Robin. Add to this the fact that she obtained extraordinary miraculous cures for both Therese Neumann and also Rhoda Wise. In fact, it is my intention to write an article for this website about St Therese's miraculous intercession in the lives of these several mystics. I hope to do so in the upcoming weeks. You're right about women-mystics outnumbering the men, especially in regards to Stigmatics. Women have a greater capacity to empathize when it comes to suffering... and one thing to keep in mind - where victim-souls are concerned - was that there were more women who accompanied Jesus to the cross than men. So I'm not surprised that He chose to favor more women with the Sacred Stigmata. As far as who the "greatest" victim-soul would be... in my humble opinion, it would be a tie between St. Lydwine of Scheidam and Bl. Anne Catherine Emmerich, although all victim-souls play an important role in the spiritual-life of the Church. Thank you for your excellent comments. The greatest mystic/soul victim in the Church----now that is certainly a subject for a lively discussion! But how can one even judge such a holy contest? It would certainly have to be judged first and foremost on the depth of the soul victims love for God and souls, and obviously there is no way to measure another persons love--obviously only God can do that. But, lets just say we put aside each one's interior life and virtues and simply judge by externals--well then I think some comparisions can be made in the exterior sphere. And this is why I suggested that St (Padre) Pio, for example, could be considered one of the greatest victim souls, given that he was a soul victim for such a long time (well over 50 years) and bore the stigmata continously for 50 years and 3 days. and I think therefore that one can see the great differences in the comparision between these two victim souls for example. But then which one loved God and loved souls the most? Of course only God can answer that. In the end though the subject of the greatest victim souls surely makes for a lively discussion! St. Therese also appeared to the mystic and visionary of Betania, Maria Esperanza, whose cause for sainthood was opened this year. I suffer hidden stigmata and am a victim soul, and I have been given incredible graces but I am 47 so it is not a rule. I am a Secular Franciscan and an extraordinary minister to the sick. Thanks so much for the info about St Therese appearing also to Maria Esperanza. I was unaware of this. I hope then to include her also in the upcoming article on St Therese's appearences to various mystics. Hi! Have you heard of Maria Luisa Piccarreta, a mystic and a victim soul? She was bed-ridden for more than 60 years and live without food and water but the Holy Eucharist. She is called " Little Daughter of the Divine Will" and was given messages that comprised 36 volumes written over a period of 40 yrs. I hope you get hold of this Book of Heaven. Thank you for your kind message regarding the Servant of God, Luisa Piccarreta. Actually, thanks to a recent suggestion from another friend in Christ I have just recently begun reading into her life. Also, I see that her cause for canonisation is making some favorable progress. God willing, perhaps I will create an article about her in the near future. Terese of Lisieux had a very significant role in BROTHER MARCEL VAN CSSR's mystical life. She was his teacher, companion and model. Br. Marcel Van died in a Vietnamese prison under communist regime where he was taken because of his religious condition. Thanks so much for the information about St Therese's appearences to the Servant of God, Brother Marcel Van C.S.S.R. I have read a bit about him and according to the author of one of his biographies, Brother Marcel Van is considered a "spiritual little brother" to St. Thérèse of Lisieux, in light of her appearences and the spiritual guidance that she gave him. At age 14, he read St. Thérèse's "Story of a Soul" and, shortly after, he began to hear St. Thérèse speak to him. This mysterious exchange between St Therese and Br. Marcel Van lasted until the end of his novitiate. The Informative Process of the Cause for the Beatification of Brother Marcel Van was opened in 1997. So it seems that St Therese has interceeded in an extraordinary way in the lives of at least five mystics. I hope to soon gather all this information about St Thereses' heavenly intercessions in the lives of these mystics together into an article, because I think it will make for a very inspiring and edifying read. Great work! Why are more women called to be mystics? It seems to me that God in His infinite wisdom has pierced the veil of our natural roles. While He has called women to connect with Him through their magnificently deep capacity to love, He has called many more men to suffer for Him as martyrs. Neither one “more holy” than the other; just a recognition that men and women were created differently for His delight. I am rather glad He did! This post is very interesting too. I found it on 'SpiritDaily.com'. There's another mystic who died at age 33. She was from Quebec City, Canada. Her name was Dina Belanger. She entered the Congregation of Jesus and Mary in Sillery (a suburb of Quebec) in 1921, taking the name of Marie Ste-Cecile de Rome (Mary St. Cecilia of Rome). She was musically gifted as a pianist, taking lessons at an early age and going to New York City for further education at a conservatory there. While in the convent, she taught music to the students in the boarding school. But she spent a lot of time in the infirmary with various illnesses. She had mystical experiences which culminated in Our Lord 'substituting' Himself for her. She relates her experiences in an Autobiography that she wrote under obedience to her Superiors. The only ones who knew of her inner life were her Mother Superior and Novice Mistress-much like Josefa Menendez. Dina died on September 4, 1929, at the age of 33. I forgot to say that she was born in 1897, six months to the day before the death of St. Therese. She had tuberculosis of the lungs like the Little Flower, and died in the same physical posture as St. Therese. She was beatified in 1993. Her tomb is in the chapel of the Convent of Jesus and Mary in Sillery. Unfortunately, the convent building she knew was destroyed by fire in 1983. So it's a smaller modern house. I've been there twice, and there is a small museum showing personal possessions of hers. She has sometimes been called 'The Little Flower of Canada'. Thank you for the interesting information about Blessed Dina Belanger. Bl. Dina wasn't quite 33 years old when she died---she was actually 32 years, 4 months and 5 days. Blessed Dina Belanger was given the Stigmata by our Lord and was quite an extraordinary mystic from our homesoil here in North America, and I hope to create an article about her for this website in the very near future. About your doing a future article on Blessed Dina Belanger...very cool! I'll look forward to reading it! I have an older edition of her Autobiography, called 'Canticle of Love', as well as a smaller book 'A Canadian Mystic of Our Day' (a 'reader's digest' version of 'Canticle'). Both have photos of Dina and the places associated with her. Another book I bought when I visited Sillery Convent a second time in 1998, titled, 'Courage to Love', by Sister Irene Leger, a Religious of Jesus and Mary from Canada. One of the illustrations in that book was a piano piece Dina wrote called 'Ricordanza'; in my older edition of the Autobiography there was an illustration of her actual handwritten manuscript of this musical piece. I also bought a cassette tape of her extant musical compositions during my 1998 visit. One side of the tape was a Mass composed by a former student of Dina's who entered the RJMs in honor of the Beatification of Dina, the "Ricordanza Mass'. Thanks again for all the interesting information about Blessed Dina Belanger. I have only read a little about her, so I am very interested in knowing more about her holy life, especially since she was a mystic so close to home. I was just reading about how she was given the stigmata on January 22, 1927. She is truly a remarkable soul! Well, that particular person made a simple comment that didn't require a reply...he didn't ask a question. So I didn't think a reply was needed. I sincerely desire to keep this website an open forum for the discussion of mystics and soul victims and all that concerns them, and I leave everyone free to comment, because I really do appreciate the comments and information that others provide. For those interested, I just published an article on the Servant of God Luisa Piccarreta as suggested by a reader in the comments above. And now I am currently working on an article on the miraculous intercession of St Therese of Lisieux in the lives of four 20th century mystics. I was reading through the earlier comments and came across the small amount mentioned about St. Therese appearing to Servant of God Maria Esperanza, and I would just like to say that I think an article on her life would make for an extremely interesting read. I actually know her family very well (her children, grandchildren and husband) and the pastor at my parish in New Jersey knew her for 8years up until her death. I don't know if you know this, but she had (and still has) a very strong following in the United States, so much so that 4 or 5 of the 12 Betania "prayer groups" around the world (kind of like satellites of the original in Venezuela) can be found in the U.S. This is something she predicted would happen long before her death. She also predicted that Betania, Venezuela would be a refuge for many during the future and a center for evangelization, especially among the youth of the world (and the U.S) which is happening right now. Well anyway, I can go on forever as knowing her family, learning about her, and going to Betania have completely changed my life. But being that she is so recent (having died in 2004), and that she had such an extraordinary amount of mystical gifts, and that much of her mission from God is still being carried out through her family and the mystical phenomena that still occurs in Betania, I felt inclined to make this suggestion. Thanks for your comments and for the suggestion of adding Maria Esperanza to this website. In fact, I just ordered a book about her last week and also I have been doing a little research about her on the web. I am going to read the book as soon as it comes in and, God willing, I hope to create and article about her and add it to this website soon. I may have have some questions about her life as I go along so I was wondering if perhaps you can send me an email so I can correspond with you via email if necessary. My email address is: gdallaire1@gmail.com (or click on the "contact" link at the top of this website). Thanks again Dan and I hope to hear from you in an email. So, thanks to Francis' suggestion I spent some time online reading about the holy life Rose Prince, who was a native american who was part of the Carrier Nation in British Columbia, Canada. Her life is certainly very inspiring and edifying! I am hoping to be able to create an article about her for this website but so far I have not been able to find a whole lot of information about her spiritual life and devotion, and unfortuneately I am unable thusfar to find any books about her. Rose suffered with severe curvature of the back (scoliosis) and lost her parents to influenza when she was 17. She died of tuberculosis at age 33. Since some witness to her holy life have given statements and also a few of her sayings have been preserved, it is evident that she had a deep piety and devotion. However, I have yet to find any information as to whether she was a mystic, and if she ever received any mystical graces. I am going to write to the Diocese to see if I can get more information about her. In closing, I sincerely thank Francis for suggesting Rose Prince whom I had never heard of before. If I can get sufficient information I will certainly write an article about her. Father Zlatko Sudac was born on January 24th, 1971. He is from Krk Island, Croatia, in the northern Adriatic Sea. He was ordained a priest on June 29, 1998, and is a priest for his home diocese of Krk, Croatia. Fr. Sudac first received the stigmata, in the form of a cross on his forehead in May, 1999. Almost a year and a half later, on October 4, 2000, the feast day of St. Francis of Assisi, Fr. Sudac received the stigmata on his wrists, feet and side. Fr. Sudac's ministry and his gift of preaching have led him to many different places in the world, including the United States where he has conducted many retreats and seminars. His primary ministry, however, is as spiritual director of Bethany Retreat House, in Croatia. At Bethany House, Fr. Sudac has welcomed not only Croatians, but people from all over the world, to his retreats. Fr. Sudac is a priest in good standing with his bishop, and with the Church, and he humbly submits to the authority of the Church in all matters related to his gifts and ministry. Thanks for passing along the information about Father Zlatko Sudac. I have read a bit about him a several times in the past. I have read that countless people have been inspired by his retreats, but the fact that he is in good standing with his local Bishop is the most important sign of all, as you certainly know. For, the "litmus test" of authenticity for the Catholic church is the mystics obedience to one's Bishop. Hopefully he will continue to always be a faithful son of the Church and perhaps someday I will be highlighting him on this website! Thanks so much for the info about Blessed Margaret of Costello. Indeed she is another one of the numerous Saints, Blesseds and holy people who, like Jesus, died at age 33. I think you might find it interesting that Alexander the Great, a precursor to christianity, also died at 33. Thanks for the information--It is interesting about Alexander the Great, although it must be said in relation to this article that he certainly was not a mystic or a Saint, since according to his biography in Wikipedia it says "He [Alexander] believed himself a deity, or at least sought to deify himself". Also it says he: "Most infamously, Alexander personally killed the man who had saved his life at Granicus, Cleitus the Black, during a drunken argument at Maracanda. And speaking of drinking it says: "he had a severe lack of self control with alcohol." So, although it is interesting that he died at age 33, he certainly is not a good candidate for this particular article, that's for sure! I missed a point Luisa Piccarreta, was closed down about 5 years agoby the Church I thought something wrong in her prayers. "To purify the world the first time, My Father sent the Deluge to bathe the world with water; the second time He ordained that it be bathed with blood, and with what Blood! Neither the first nor the second Purification was sufficient to transform mankind into the children of God. Now the Father is weary and allows the scourges of hell to break forth, so as to destroy the human race because men have preferred hell to Heaven. Their master, Lucifer, tor¬tures them, in order to incite them to curse Us, making them so completely his own children. I would come again to die for them a second time, to save them from an even more terrible death... but My Father will not allow Me to do so... My Love would allow it, but Justice will not. Justice knows that it would be use¬less. Therefore, I will come only at the last hour. But woe to those who will see Me after they have chosen Lucifer as their Lord! My Angels will need no weapons in their hands to win the battle against these antichrists. My Look will be enough! Oh, if men would once more learns to turn to Me, Who am their Salvation! That is all I desire. If I cry, it is be¬cause I see there is nothing I can do to make them look to¬wards Heaven, from where I am stretching out My Hands to them. Suffer, Maria, and tell good souls to suffer, to take the place of My second Martyrdom, which the Father does not want Me to accomplish. To every one who offers himself as victim, will be given the salvation of some souls. Some... and it is not to be wondered at, if those souls given to each little redeemer are but few, when one reflects that at the hour of My Immolation on Calvary, from amongst all the thousands of people present at My Death, I, the Divine Redeemer, succeeded in saving only the good thief, Longi¬nus and so few others..."